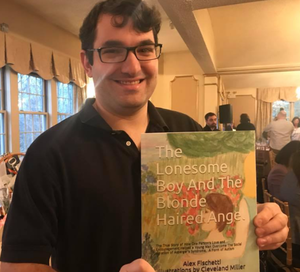 Ridgefield resident Alex Fischetti, at 2009 graduate of Ridgefield High School and member of SPHERE, just released his first book, The Lonesome Boy and the Blonde Haired Angel, available in print and Kindle via Amazon. In the beautifully illustrated picture book, Fischetti shares his personal journey from a world of social isolation as a result of Asperger syndrome, to a life of joy. We sat down to ask him a few questions about his newly released book. Why did you write The Lonesome Boy and The Blonde Haired Angel? Answer: I wrote this book because I wanted to pay the BEST tribute I could to a person whom, if The Lord hadn’t led me to her, I would probably not be here talking to you right now. I was a very isolated person and my heart wasn’t really open to the positive surroundings around me. I wasn’t totally alone, but I didn’t really know how to connect like I do today. I never even went to any dances or proms! Now I’m blessed to know so many beautiful people. The book and my experience is a true testament how one person can make a gigantic impact on another through simple acts of kindness and love. I know that the process of getting it published wasn’t easy. How did it happen? Answer: It was a very long process. I’m still learning as I go about promoting this thing! I could not ask for a better partner to have with me on my journey to publishing this book than my illustrator, Cleo Miller. She and I went through the Amazon outlets Kindle Direct Publishing and CreateSpace and we just constructed everything from there. It’s incredible how amazing the book looks and how Cleo’s masterpiece of watercolor drawings make it into an attractive book. I know it will be sold in massive volumes! Tell me about the real-life blonde haired angel. Answer: Her name is Reeny Sempsrott and she lives in Vero Beach, FL. Reeny is one of the one in a billion people who, if you spend just a minute with her, will fill your day with sunshine! She has influenced me in so many ways from offering encouraging words and bringing me a positive spirit. She is always praying for anybody in need and inspired me to ask The Lord for the courage to open my heart to others. I can’t say enough about Reeny. I love her so much and will be eternally thankful to the Lord for her being my angel. Your use of biblical quotes throughout the book compliments the story beautifully. Did you choose them? Answer: Thank you so much! Yes! I chose every single one! I flipped through both the Old and New Testament to try to find the best verses that go with each page. There are some well-known ones featured like Jeremiah 29:11 and there are those you may not immediately remember, but they are powerful. I’m praying those who aren’t as deeply rooted in their faith as I am will read the verses that go with the story and be influenced by them as well! In the story, you are the lonesome boy. Has writing the book changed that feeling? Answer: It has! Reading this and looking at the life I have now makes me so grateful to the Lord for blessing me with what I have. I always tell my friends that for the longest time I hardly knew anybody and now I know everybody! Through the Lord’s grace in bringing Reeny into my life, I was able to come out of my lonesome cocoon to become the social butterfly you all know today. Praise the Lord’s name for helping me come so far! What do you hope readers gain by flipping through the pages of your book? Answer: I pray that anybody who reads this book will come to realize that in this oftentimes dark world of ours there are rays of light that can ignite your soul and not only positively impact you, but all those around you. It can be a family member, a friend, a co-worker, anybody! As long as you keep your eyes and your heart open to finding that special somebody. it’ll happen like it happened to me. More books in your future? Answer: You better believe it! I have another book in the works that I won’t go into too much detail about it right now – I want it to be a surprise! All I can say is that it’s about another angel in my life and there is a lot of dancing is involved! I’m so excited to share it with the world just as soon as the first book hits one million in sales! Purchase The Lonesome Boy and The Blonde Haired Angel here.